The Canadian CED Network in Ontario brings together an emerging group of individuals and organizations representing a broad range of communities across our region. Members are developing strong CED initiatives and plans to strengthen and grow community economic foundations. Click the link above to download the full report or the report Highlights. 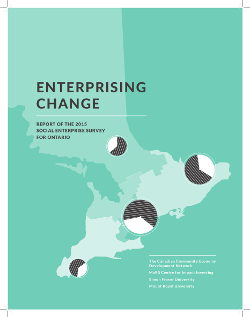 Learn the facts about the economic impact of social enterprise in Ontario, how it creates jobs, particularly for those with barriers to employment and how it works in local communities to fight poverty. The report analyses the survey data from many different perspectives, rural and urban, francophone and anglophone, nonprofit and for-profit, with a disability focus or by regions. Find out about the significant challenges social enterrpsies and the educational resources they would find most helpful, learn about whethere they plan to grow and what straegies they consider important to make that happen. CCEDNet and our research partners gratefully acknowledge the the financial support of the Government of Ontario the Ontario Trillium Foundation and the Government of Canada. Creating an online "window on Social Enterprise" linking to a compendium of accessible resources and effective SE models. In collaboration with Ontario Nonprofit Network and Pillar Nonprofit Network, theis resulted in the cration of SEontario.org. Working with the Rural Social Enterprise Constellation project hosted by the Ontario Nonprofit Network (ONN), to improve investment infrastructure in four rural regions of Ontario: Huron-Perth, Peterborough-Kawarthas-Durham, Thunder Bay region and Simcoe County. Click Here to learn about the background of the LIAISOn project, the collaborative co-applicant partners and Advisory Group members. The 2012 CCEDNet-Ontario conference attracted just over 100 participants to the Learning Enrichment Foundation in Toronto. A sold-out bus tour visited several social purpose enterprises, and the conference featured speakers looking at strategies for innovation in an age of austerity, generating revenues, co-operative development and growing inequality, along with a variety of workshops. The conference also launced the collaborative CCEDNet-Ontario led LIAISOn project to support social enterprise development in the province and hosted the Toronto launch of The Resilience Imperative by CCEDNet founding member Mike Lewis. Many thanks to the event steering committee and funders. For further details and to download resources shared through Connections 2012 visit our event page. Click here for more information about last year's event and for resources coming out of that event. We encourage you to display this poster proudly in your workplace to illustrate to your staff, clients and community partners how your organization contributes to something bigger: a broad-based movement made up of many different kinds of organizations, all committed to community economic development and working to strengthen local communities. Click on the poster to download it. Organizations that become members during this year will have their logos included on next year’s poster. Click here to become a member. 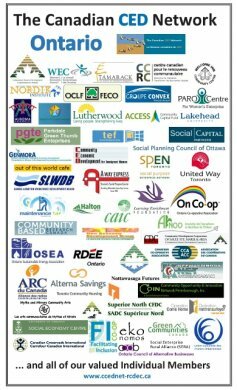 CCEDNet Ontario works closely with other regional partners through the Ontario Social Economy Roundtable (OSER). One of the significant outcomes of this collaborationhas been the production of four Social Finance Policy Papers. A package deal should offer both an incentive to investors and a vehicle for matching investors with enterprising nonprofit organizations. This package should consist of a tax credit for the investor, and an investment fund that receives monies and makes investments in qualifying organizations. The Ontario Social Economy Roundtable paper shows how tax incentives can best be used as a mechanism to improve the sector’s access to capital. Community-based nonprofit social enterprises should have access to this source of funding. The Ontario Social Economy Roundtable report describes how this might best be done so the government and sector can move forward on this initiative. This change would give nonprofits the same powers as those provided to cooperatives under the Cooperatives Act, using the same regulatory process. The Ontario Social Economy Roundtable business plan for community bonds will help government and the sector move forward on this initiative. A provincial social enterprise investment tax credit or regulated community bonds, would benefit Ontario’s social economy most if they were eligible for registration under Registered Retirement Savings Accounts and Tax-Free Savings Accounts. Liaison with the Canada Revenue Agency will be important to smooth the registration process for individual non-profits and social investment funds. Recommendations to implement these policies were included as part of ONN’s submission to the Ontario Partnership Project. Their adoption by the provincial government would open up the social finance field to engage citizens in becoming investors in social enterprise and would provide concrete benefits enabling social enterprise to thrive in Ontario. It would deliver big impact with minimal cost. The Network came together on several occassions to discuss their strategic approach to the Government of Ontario's consultations on reviewing the forest tenure system, and the Proposed Growth Plan for Northern Ontario. Professor David Robinson from Laurentian University shared his knowledge with the Network, allowing members to attend the consultations with and informed and unified voice. Professor Robinson was recently a featured panelist on TVO's 'The Agenda' with Steve Paikin, where he strongly advocated for community control of the natural resources in Northern Ontario. Click here to watch the episode. The Canadian CED Network Partners with ONN and OSER on Regional Consultations: The Canadian CED Network, working closely with the Ontario Nonprofit Network (ONN) and the Ontario Social Economy Roundtable (OSER), co-ordinated a series of province-wide regional consultations. The day long events engaged local community organizations on sector issues and and stimulated discussion on what needed to be done to improve the capacity of the sector. Submission to the Ontario 2009 Pre-Budget Consultations: On November 21, 2008, the Canadian CED Network's National Program Director, Paul Chamberlain, spoke during one of the provincial government's pre-budget consultations, stating the case for the inclusion of CED in the provincial budget. Click here to read this submission. Creating an Ontario Not-for-Profit Corporations Act: The Canadian CED Network issued a response in the Ministry of Government and Consumer Services' process for modernizing the Ontario Corporations Act. The Canadian CED Network reviewed many of the responses and briefings of other involved organizations and key players and have engaged our Ontario members in developing our own response. To read the document, please click here. With support from the Ontario Trillium Foundation the Canadian CED Network advanced the network in the province, providing regional workshops and tele-learning sessions to inspire further collaboration and information sharing within the CED sector. A youth internship pilot program created CED work experience opportunities to Canadian immigrant and Aboriginal youth in the North. 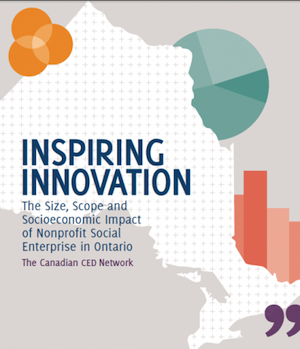 The Canadian CED Network collaborated with other leaders on the Ontario Social Economy Consortium (now OSER) to build the social economy of Ontario. A major focus of this project was the proposal to develop an Ontario Social Enterprise Trust to provide long-term patient capital loans to social enterprises throughout the province.